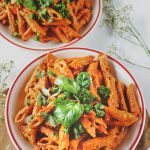 I’ve been loving this easy, flavourful 30-minute pasta recipe lately. There’s just something so comforting about pasta, especially when it’s tossed in a rich, creamy 7-ingredient sauce. This recipe is extremely lazy, you only need to roast a pepper, and while that’s in the oven you can cook your pasta. Then blend the sauce, toss it with the pasta, and voila! Comfort food heaven! 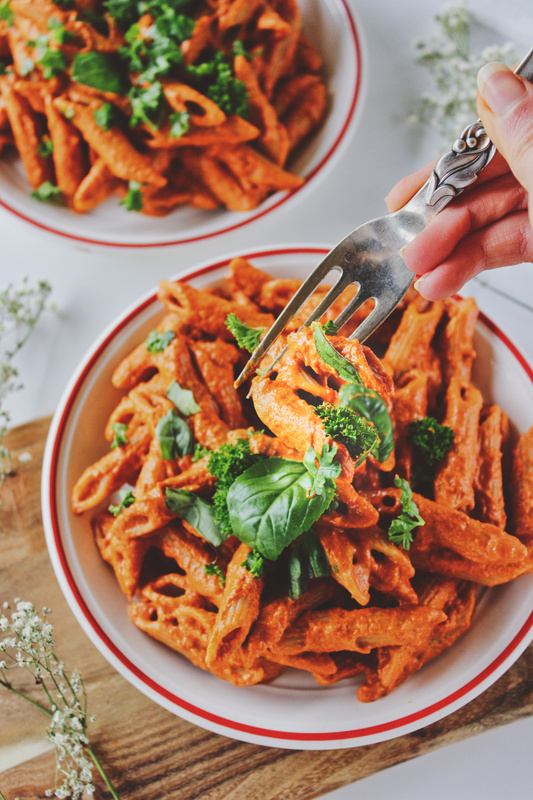 This Sun-Dried Tomato Roasted Red Pepper Pasta is radiating flavour from the sun-dried tomatoes, the roast red pepper, sweet paprika, some tangy lemon juice, a dash of apple cider vinegar, and a drizzle of tahini. And it works well as a lunch on the go, too, so you can make a big batch and store it in the fridge for the busy weekdays. 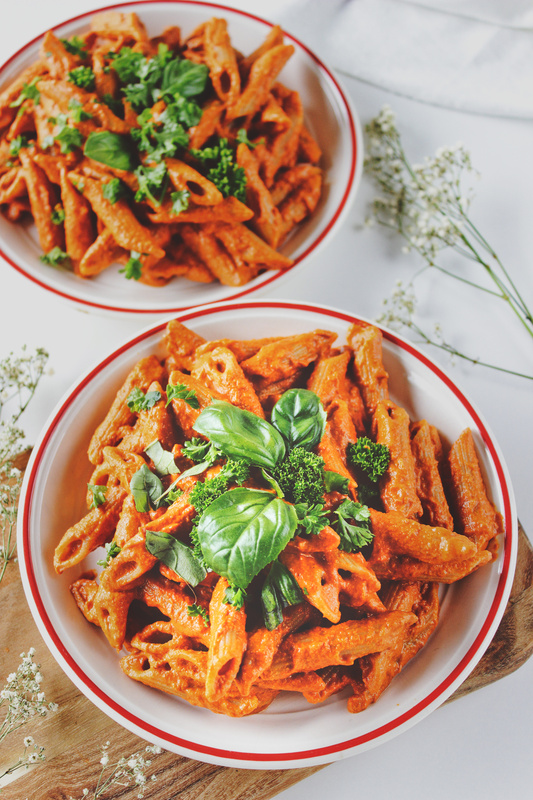 This pasta is incredibly comforting just as it is, but it doesn’t have a lot of texture going on nor any direct protein source, so if you’d like, you could definitely add some cooked chickpeas, lentils, or faux meat to it to make it even more delicious and nutritious! I’m writing this recipe very last minute (actually 11 minutes after it was supposed to come out) because I had a major case of procrastination. I was going to write it at 11 o’clock (an hour before publishing), but of course my blog server decided to go down at the same time. Is that the Universe’s way of trying to teach me an important lesson? If you like pasta recipes, you’ll probably also like my Butternut Squash Fettuccine. It’s the only other pasta recipe on my blog so far. Expecting more to come in the future! If you decide to give this recipe a try, let me know what you think about it. Rate it, leave a comment below, and take a picture of your pasta and tag me on Instagram. My profile name is @spirendeveganer. I’d love to hear your thoughts and see your creation! I’ll see you next Friday for my Peanut, Caramel, and Chocolate Slices! Place the pepper on a baking tray lined with parchment paper and bake it in the oven for 15-20 minutes until tender and browned along the edges. 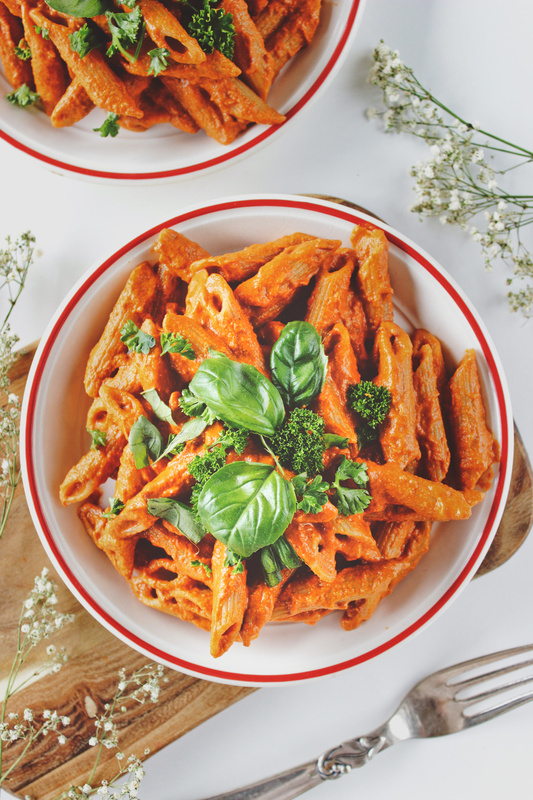 In the meantime, cook the pasta according to package instructions and place the sun-dried tomatoes in a small bowl, cover them with the warm water, and let them soak. Once the pepper is done, transfer it to a blender or food processor along with the soaked sun-dried tomatoes (and the water they soaked in), sweet paprika, tahini, lemon juice, maple syrup, apple cider vinegar, salt, and pepper and blend until smooth. Depending on the size of your pepper, you might need to add up to 1/4 cup more water to get the right consistency. Add the sauce to the cooked pasta and mix well. Serve with, for example, vegan parmesan and herbs and enjoy! Store leftover pasta in an airtight container in the fridge for up to 3-4 days. 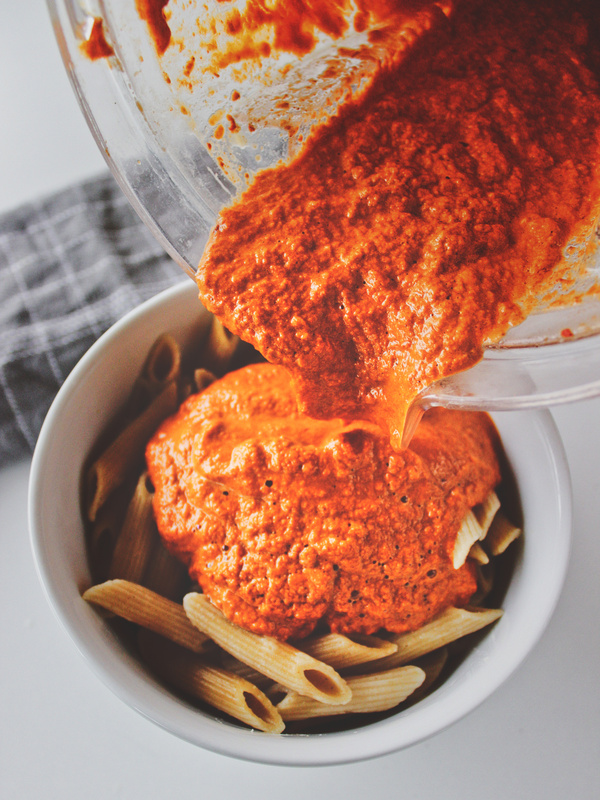 You can use more or less pasta depending on how much you eat and your preferred pasta-to-sauce ratio. 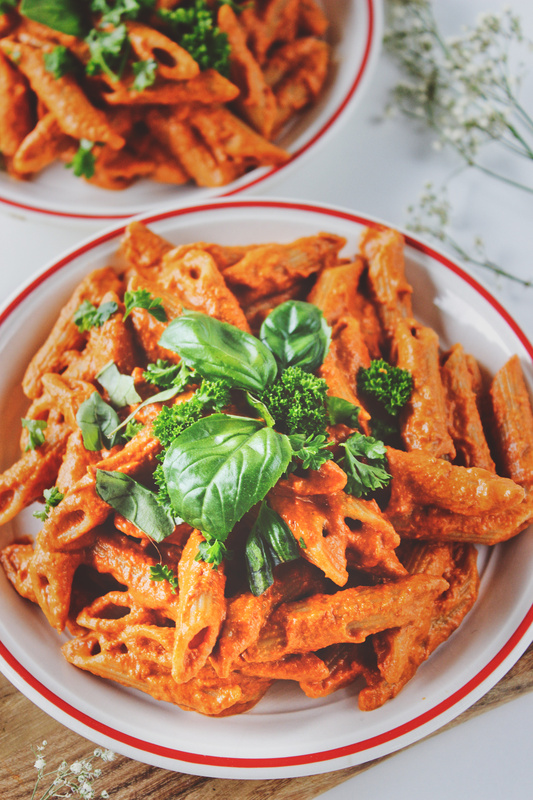 If you're missing some protein or texture, feel free to add cooked lentils, chickpeas, or faux meat to your pasta! *Nutrition information is a rough estimate calculated with 225 g dry pasta.